Impress neighbors with the sweet smells of summer cookouts, or simply create an outdoor kitchen where you are free to craft grilled masterpieces. While many homeowners decide to add a portable Grill with Cart, a select few are adding complete Grill Islands that would exceed the greatest chef's expectations. These extravagant outdoor kitchens certainly improve the value of any house, offering stucco, stone, tile, granite and other materials to match any home's exterior or pavers in the patio. WHY PURCHASE A GRILL, GRILL ISLAND OR SMOKER? WHAT ARE BBQ GRILLS & SMOKERS? Grill smokers and barbecue grills are items used to cook food using a heat source or smoke from below the food, typically fueled by natural or propane gas, charcoal, wood or infrared sources. Cooks that utilize grills and barbecue grills commonly use gas or charcoal heat sources; a widespread controversy in the barbecue industry is the debate between using charcoal versus gas due to the flavors each methods offer. Grilling and barbecuing is common in virtually every culture found around the world, yet the methods and items used to cook can vary. Grills range from massive brick barbecue units designed to smoke or cook large amounts of meat, to smaller steel grills designed for grilling in a backyard. A common smoker unit in America features an oil drum sliced in half and placed sideways. Gas Grills – Gas grills use Natural Gas (NG) or Liquid Propane (LP) as a fuel source. 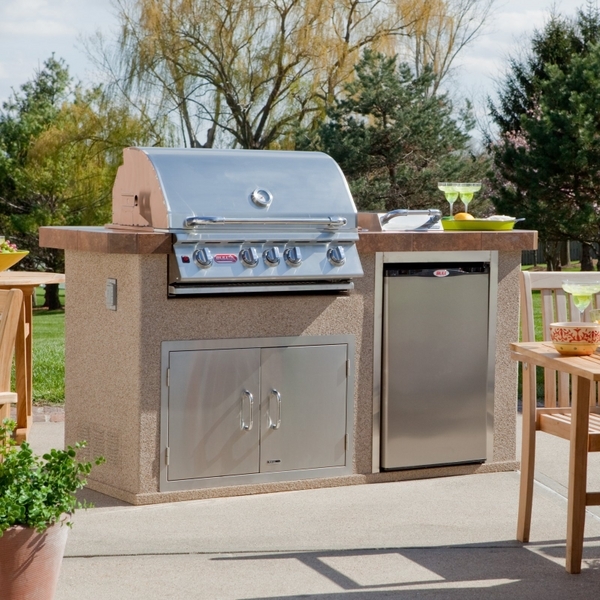 Liquid propane units are typically portable, while natural gas units are typically stationary models, or placed in a permanent grill island on a patio or in a backyard. Portable models offer the cart design, with four legs, two with wheels, so the unit can be tilted a moved for storage. Gas grills can be basic in design, with simple cooking grids, to extravagant units with many extra features such as infrared sear burners, rotisseries, pizza stones and even griddle surfaces. A few models offer smoker boxes for the cook to add apple wood chips or other wood flavors while cooking. Charcoal Grills – Charcoal grills, such as the Bison Charcoal Grill, use all-natural lump charcoal or charcoal briquettes as a fuel source. When ignited, charcoal eventually becomes extremely hot embers that discharge large amounts of heat. Currently a debate between natural lump charcoal and charcoal briquettes rages in the barbecue community. Briquettes are prized by many for their consistency in flavor, heat production and burn rates. Lump charcoal is promoted by some as offering a heightened sensory experience, adding a natural smoky flavor that lacks accelerates and other synthetic fillers. There are several categories of charcoal grills. View the Charcoal Grill Page to learn more about the various types of charcoal grills. Grill Smokers – Grill Smokers are contained vessels made from ceramic material, historically clay that allows the cook to slowly smoke meats such as pork and beef. With results similar to the Native American method of cooking in dugout pits that are covered with broad leaves, the meat cooked in a smoker is tender, juicy and full of smoky flavor. For decades Southern cooks have cherished larger smokers made from brick or sheet metal to create slow-cooked culinary masterpieces. Smokers allow the cook to add apple, hickory, maple, cherry and other wood flavors for enhanced flavor. Initially used by professional cooks and backyard barbecue enthusiasts, residential versions are now more popular than ever, such as the Saffire Grill Smoker Head pictured to the right. Grill Heads & Grill Islands – Permanent grills placed on a patio or in a backyard are typically found in a Grill Island. The grill island itself is constructed from stone, stucco, tile, granite or other stone or ceramic materials designed to match the patio or the home. Grill islands can offer many parts and components, including Grill Heads, refrigerators, drawers, sinks and even stereo equipment. They can offer both gas and charcoal models. Infrared Grills – Infrared Grills rely on heated ceramic tiles to emit thermal and infrared radiation to cook food. Infrared grills are typically ignited by natural gas or liquid propane, and are cherished for their even heat distribution and control. The ability to create large amounts of heat in a small area in a short amount of time allows infrared grills to sear meat, locking in the juices and flavor. Charcoal grills and gas grills rely on hot air to cook food; infrared grills differ from these types in that they cook food through thermal and infrared radiation. Many grills now offer smaller infrared burners, allowing barbecue cooks the ability to quickly sear their meat, locking in the juices, and then complete the cooking in the traditional method of hot air in the grill. Hybrid Grills – Hybrid grills combine gas, charcoal and infrared grills. These models grant the easy ignition of an infrared or gas model, combined with the smoky flavor of charcoal and wood grill units and smokers. Grills with Carts – Grills with Carts are designed to be completely mobile, allowing the owner to move the grill into storage or under shelter during bad weather. Offering both gas and charcoal models, grills with carts are typical backyard grill choices. Grill Burners – Burners are the source of heat in gas grills, regardless if the unit is powered by liquid propane or natural gas. They come in several shapes and sizes, including pipe, tube, rail, bowtie, bar figure 8, oval and "H" burners, since they resemble the capital letter H placed on its side. They can be made from steel, aluminum, aluminized steel, cast iron or porcelain. Cooking Grids – Cooking grates, cooking grids or cooking grills are the surface on which the food is cooked. They are constructed from metal, commonly stainless steel, but sometimes chrome-plated steel, cast iron, porcelain-coated steel and porcelain-coated cast iron. Rock Grate – A rock grate is placed above a burner, designed to hold ceramic briquettes or rock briquettes, to protect the grill burners from juices falling from cooking meat while also evenly distributing heat. Heat Shield – Heat shields typically are made from metal and serve the same purpose of a rock grate, protecting the burners from potentially damaging meat drippings. They can be referred to as heat shields, radiation shields, heat angles, heat tents, heat plates or burner shields. Valves – Valves are used on gas grill units to control the heat emitted from the burners. They can be made from everything from metal to plastic to porcelain. Searing Burner – A searing burner or simply a sear burner is a grill accessory common in newer gas models. A sear burner allows a cook to quickly sear the exterior of a piece of meat, locking in juices and other flavors. The piece of meat is then cooked in a tradition grill or oven fashion. Pizza Stones – A pizza stone allows a cook to produce pizzas that carry the smoky charcoal flavor found in a charcoal grill, similar to a traditional wood-fired pizza oven. Since prehistoric times humans have relied on fire to cook their food, mostly over an open flame contained in a fire pit. Examples are littered throughout history of various grills and smokers, regardless of location or time. Ceramic cookers, very similar to the Green Egg smokers currently popular in America, have been used in Asia for nearly 3,000 years. To avoid confusion and to be concise we will focus on the American development of the grill and North American barbecuing in general. Since before Columbus Native American tribes were cooking meat in dug-out pits and upon large wooden structures. Several indigenous groups in the West Indies, including the Arawak and Taino people, utilized large wooden structures to cook and roast meat. In the Caribbean a whole pig or sheep would be slowly cooked on a large wooden structure over an open flame, or buried in a dug out pit in the ground that was then covered with broad leaves, typically maguey leaves, to hold in the heat and smoke. E.G. Kingsford is credited with inventing the modern charcoal briquette, which was originally called Ford Charcoal; his product (pictured left) is still used today by millions, the company being renamed in his honor the Kingsford Charcoal Co. It is currently owned by The Clorox Company, and is the leader in the charcoal briquette industry in both innovations and sales. While large grills and smokers were common throughout the United States, home versions were rare. This changed with the introduction in 1952 of George's Barbecue Kettle, later known as the Weber Kettle Grill. Designed by George A. Stephen, an employee at Weber Brothers Metal Works in Chicago, the Weber Kettle Grill was the first backyard grill unit that was compact, easy to light, easy to maintain and simple to operate. Stephen cut a Lake Michigan buoy made from steel in half and constructed a dome-shaped lower grill with a matching circular lid and three legs. His neighbors jokingly referred to his backyard cooking unit as "Sputnik", since it looked similar to images of the Russian satellite. Initially produced within a division of the Weber Brothers Metal Works factory, Stephen eventually bought out the Weber Brothers name, calling the newly formed company the Weber-Stephen Products Co., and devoted it fully to grill production. Popularity increased throughout the 1950s and 1960s; "the Weber" (an original is pictured right) came to describe any dome-shaped backyard grilling unit. The popularity of Weber's design sparked many copies and innovations. In the early 1960s Melton Lancaster and William G. Wepfer, employees of the Arkansas Louisiana Gas Company, invented the outdoor gas grill by converting a Weber Grill in Wepfer's garage to use natural gas. By the 1970s, virtually every neighborhood in America offered several backyards with grills and smokers, either fueled by charcoal or gas. Bull Grills – This manufacturer offers charcoal and gas grill models made from stainless steel, as well as ceramic egg smokers such as the Kamado – Charcoal. Drop a Bull Grill head into your grill island, or add a portable Bull Grill with cart for easy mobility. And Bull Grills offers many options, add-ons and special features such as infrared sear burners and pizza stones. Saffire Grills – This traditional manufacturer showcases some of the very best ceramic egg smokers available on the market. For a mobile unit that can be stored away when not in use add a Saffire Grill Smoker with Stand & Shelves or drop a Saffire Grill Smoker Head into a grill island. This manufacturer also offers grill carts, one with a wood surface, and another with a beautiful granite top. Saber Grills – This innovative manufacturer offers a full line of Infrared Grills for your backyard or patio. Choose between grills with carts constructed from stainless steel, such as the SABER Cast 330 Infrared, to infrared grill heads that can be dropped into a grill island, such as the SABER SS 670 BI Infrared model. Fire Magic Grills – Fire Magic focuses on high temperatures with their line of high-end outdoor grills. Loaded with the latest technology, Fire Magic Grills offer the ability to control the heat in zones with various knobs, controlled stainless steel E Burners, high BTU output in every model and small special touches such as infrared backburners, electronic ignition, brass side burners and much more. Delta Heat Grills – The word delta is commonly used in science and math to describe a dramatic change in energy and that is precisely what Delta Heat Grills accomplish: they get really hot really, really fast! Each Delta Heat Gas Grill showcases the Direct Heating System, which uses ceramic briquettes to quickly build temperatures and evenly distribute heat. Twin Eagles Grills – Created by Dante Cantal in 2000, Twin Eagles Grills uses the iconic nature of eagles to represent their brand. Cantal is an award winning grill engineer creating commercial cooking units for restaurants, casinos and hotels. Twin Eagles Grills utilize a combination of direct heat from specifically placed ports and channels and radiant heat from ceramic briquettes.